Donors, local librarians and “apple nerds” show off newly published apple reference books now available at Dolores, Mancos and Cortez libraries. These apple books document more than 16,000 varieties and include 1,400 lifesize watercolors of historic and modern apples. 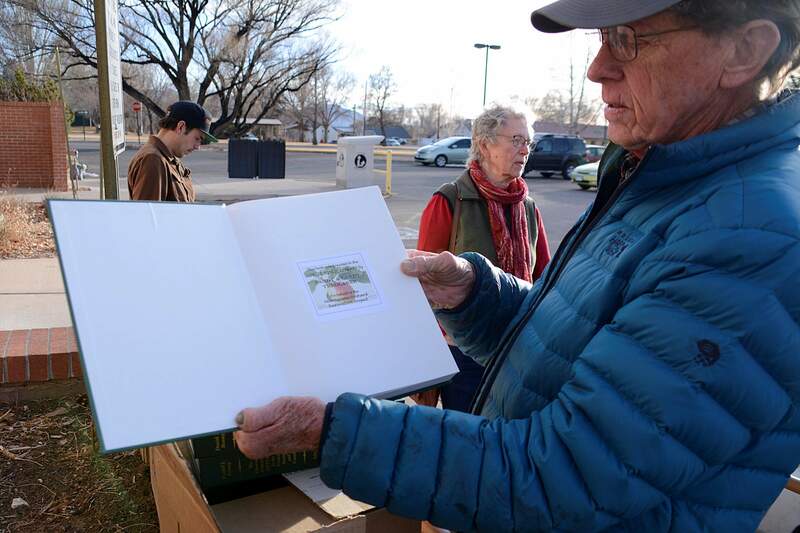 Lew Matis, a member of Montezuma Orchard Restoration Project, holds one of the apple reference books being donated to the Cortez, Mancos and Dolores libraries. A fundraising campaign has resulted in local libraries each receiving a newly published set of reference books on apple varieties. The Illustrated History of Apples in the United States and Canada by Daniel J. Bussey and Kent Whealy is the most comprehensive source on the topic, said Lew Matis, a local historian who organized the fundraiser. He found 21 people willing to donate $50 each. 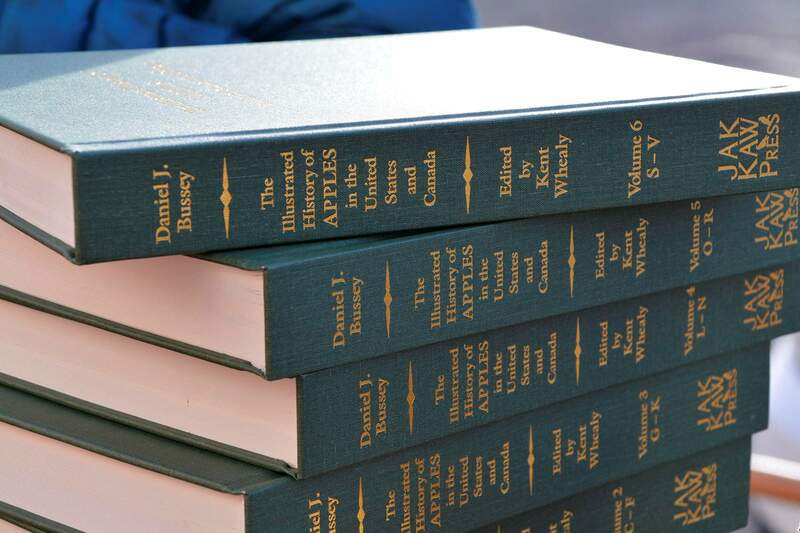 One seven-volume set costs $350. The reference set documents about 16,300 apple varieties from the last two centuries. It contains 1,400 watercolor illustrations and includes the history, flavor attributes and scientific data of apple types and trees. The books are especially appropriate for Montezuma County, which has been moving forward on an apple orchard revival – a market that thrived here more than 100 years ago. Jude Schuenemeyer of the Montezuma Orchard Restoration Project said the reference books are valuable in helping to identify local historic apple varieties he and others are trying to bring back into production. The books will also interest the casual historian and horticulturist, said Cortez Library Director Eric Ikenouye. “Apples have a unique history in Montezuma County, so having these available is really important, plus they are beautifully illustrated,” he said. 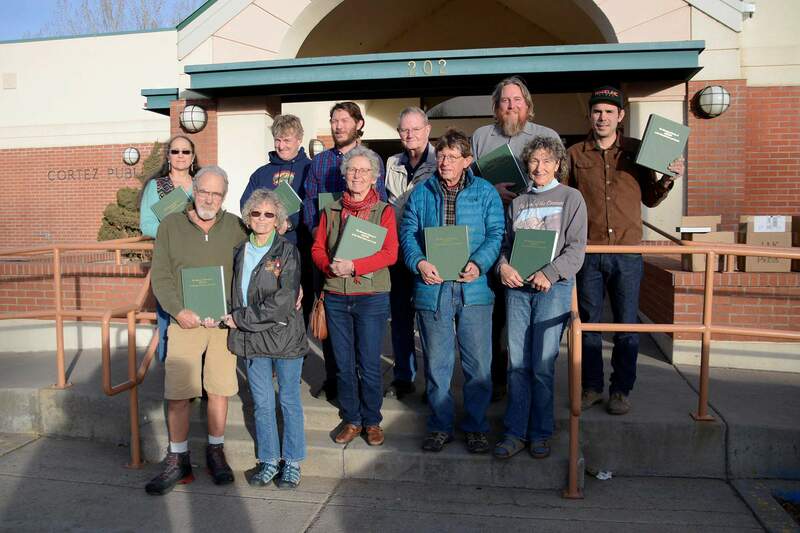 With all of the historic orchards in the area, there is a real opportunity to grow for the cider market, and the books are a good resource for that as well, added Mancos Library Director Lee Hallberg. The donors for the books include Laurie Austin, Ric Plese, Kim Welty and Cap Allen, Ashley and Ben Carelock, Pat and Jack Burk, Jorie MCann and Chad Close, Kim and Eric Lindgren, Gail and Vic Vanic, Janine Fitzgerald, Robin and John Lyle, Carolynn Landes, Kathryn and Richard Fulton, Neal Wright, Sam Perry, Linda Towle, Lynn Utick and Art Rohn, Josh Horner, Addie and Jude Schuenemeyer, Martha and Dusty Teal, Lew Matis, Sandy and Larry Tredlaner and Anna Taugher.